PHILADELPHIA, PA--(Marketwired - Oct 13, 2015) - Today, the Business Intelligence Group announced the winners of the 2015 BIG Awards for Business program. Using a proprietary judging process scored by well-known and experienced leaders and executives from around the globe, the BIG Awards specialize in recognizing top-performing companies and organizations. "Ambition, focus and execution are all characteristics of this year's winners," said Russ Fordyce, Managing Director of the Business Intelligence Group. "Our judges were inspired by the people behind the great performances and those who led these organizations to excel. We are so incredibly proud to reward each and every winner and finalist." 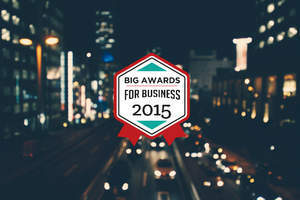 The Business Intelligence Group also named several companies as finalists in the 2015 BIG Awards for Business; these include Agilysys rGuest® Stay, IgnitionOne AppAudience, FinancialForce.com, Leadspace, Magnitude Software, Qnovo QNS Battery Improvement Software and TouchCommerce. The company also announced the deadline of December 4th for the annual Big Innovation Awards. "Innovation is clearly driving growth across the globe and within every industry. Technology has changed every aspect of our personal and professional lives," Fordyce said. "We look forward to showcasing the innovations driving this change." Organizations that would like more information about the 2016 BIG Innovation Awards and past winners can visit the company's website. The Business Intelligence Group was founded with the mission of recognizing true talent and superior performance in the business world. Unlike other industry award programs, business executives--those with experience and knowledge--judge the programs. The organization's proprietary and unique scoring system selectively measures performance across multiple business domains and then rewards those companies whose achievements stand above those of their peers.